Welcome back to the In-App Purchase Inspector- our regular look at free-to-play games from the consumer's perspective. This time, we're taking a look at Kabam's take on a sci-fi institution: Star Wars: Uprising. 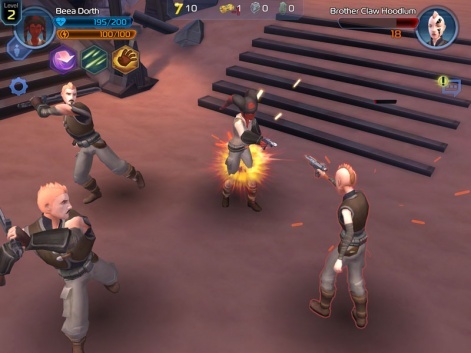 As I discussed previously in regards to Rumble Entertainment's enjoyable KingsRoad, the action RPG is a genre well suited to both the mobile platform and the free-to-play model. Traditionally mouse-based controls map smoothly to touchscreens, combat is simple and satisfying enough to be enjoyed in short bursts, and the loot-obsessed, meta-game design has obvious applications in the F2P space. With Star Wars: Uprising, Kabam has further proven this to be the case. Keen to prove its role-playing chops right out of the gate, Uprising kicks things off by allowing you to choose your character's species - Zabraks, Twi'leks, Humans, and Miralans are all on offer - before naming them and fiddling with a few minor cosmetic details. One of Uprising's greatest successes is its control system. I chose a Zabrak - also known, to those unfamiliar with Star Wars, as The Red One. One of Uprising's greatest successes is its control system, which manages to keep longing thoughts of mouse and keyboard at bay by having you tap to move, fire automatically, and use a satisfying drag-to-aim system for special attacks. Maintaining its typically high production values, Kabam has put together a proper action RPG - with much of the depth of loot and customisation you'd expect - all wrapped up in a well-realised world. The dialogue's light, jovial, and delivered in quick bursts - more The Clone Wars than The Empire Strikes Back - but there's a clear respect here for the legacy of an IP that means so much to so many. And is likely to get a strong boost with the arrival of the new film later in 2015. A far cry from some of the half-hearted mobile efforts punted out the door to capitalise on popular franchises, Uprising has clearly been developed by a team that cares about its source material. Pleasingly, the game's positive first impression also extends to its monetisation. Kicking you off with 300 Chromium (the game's hard currency), it's a haul that would cost $9.99 to buy with IAPs. It's a move that shows Kabam is betting big on reciprocity, with immediate generosity up there with Rival Kingdoms. Chromium can - initially at least, be bought in bundles ranging from $4.99 for 150 to $29.99 for 945. This seems like a low value economy, but Kabam has cleverly limited the price of available IAPs, but if you buy the most expensive option at any time, the store will upgrade with a more expensive option the next time you visit, up to the maximum of $99.99. As you'd expect of any action RPG worth its salt, the economy is built around loot. Regardless, Chromium can be somewhat hard to come by following the initial splurge, but its applications are limited enough for it to not affect standard gameplay too much. There's no energy system to speak of, and the regular income of Credits - Uprising's soft currency, earned through daily rewards, completing quests etc. - is enough to keep you playing freely. As you'd expect of any action RPG worth its salt, the economy is built around loot, hence powering up your character. Weapons and armour all contribute to your overall level and player rating, which in turn affects your preparedness to take on quests. The difficulty of each quest is assessed based on its difficulty versus your player rating - if you come up short then you won't be permitted to play, while if you're only narrowly over the minimum rating the quest status will be deemed 'Risky'. Loot, being a key part of the monetisation push, is not simply found strewn about the battlefield as in genre mainstays like Diablo, but is always given as a reward. Each quest features guaranteed rewards - items, experience, Credits, etc. - but there is also an element of luck at play in that more powerful 'Possible Loot' is only given randomly. 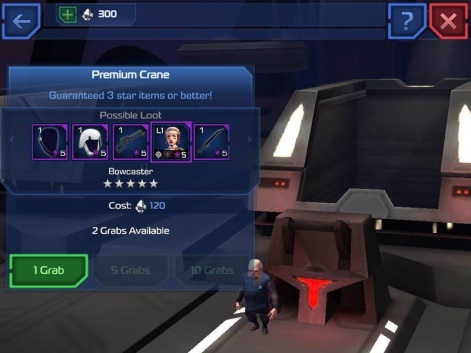 Uprising's Premium Crane will choose you a random item guaranteed guaranteed to be worth at least 3 stars. You're also given the option of standard and minor reward tiers, meaning you can opt for a lesser challenge in return for lesser rewards. Lots of the loot you receive through quests is relatively low-level, and this is where the game's gacha (or random rewards) system - on which you'll be spending the majority of your hard currency - comes in. At 120 Chromium a go (a rather hefty $4 in real money), Uprising's Premium Crane will choose you a random item guaranteed guaranteed to be worth at least 3 stars. However, while that may seem a little steep, new items are the only thing you'll be likely to spend money on and it really is an optional exercise. Quest rewards will be more than adequate for many. Furthermore, using the Premium Crane quickly feeds into the game's other systems to make for a satisfying experience. The discovery of new items is incentivised with Credits and Requisition Scrips. Requisition Scrips are used to power a separate crane that yields components, which in turn are used alongside Credits to level up your gear. It's a great example of mechanics working in harmony with one another, and evidence of a studio that really understands the model and how it works. It's a credit to the game, then, that there's really not much else to speak of in the monetisation department, other than the fact you can pay 60 Chromium to revive when downed in action. Again, the actual price is a little excessive - equalling $2 in real money - but the point is that there's no real requirement or pressure for you to do that. It's simply there if you want it. As it turns out, I did. Opting for the $9.99 tier, the 305 Chromium that yielded me was enough for me to use the Premium Crane twice and revive mid-quest once. 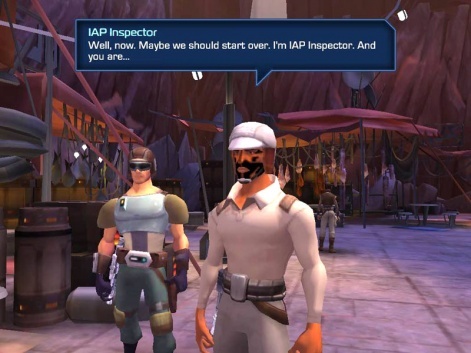 The overwhelming feeling is that Star Wars: Uprising is a high quality game. Again, the IAPs are expensive and my yield didn't feel like it was entirely worth $9.99. And while I've played the game for a while, I've yet to even approach its midphase - where there's a chance that increasing difficulty will put additional pressure on non-payers. Similarly, Kabam may be ensuring that Uprising is designed to be very kind in its opening phases, given the mass market appeal of the brand. However, my experience is an overwhelming feeling is that Star Wars: Uprising is a high quality game. Larger, less frequent IAPs purchases can be more conducive to good gameplay compared to being nickel-and-dimed for smaller amounts with wait timers etc - tricks that Uprising avoids. And though its execution may be imperfect, for that, Kabam deserves praise. How does Alliance: Heroes of the Spire monetise? 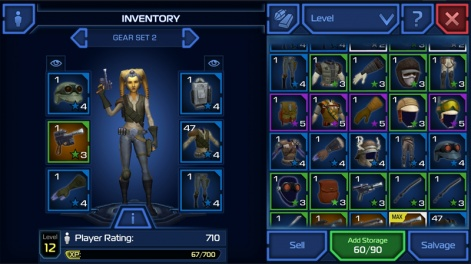 Which Star Wars mobile F2P game took best advantage of The Force Awakens buzz? I really like the idea of an "upgrade" to the store It gave me other nice ideas to implement in my own games.